Looking out my kitchen window, I see a lane full of litter and a biggie-size Vancouver Special–the kind with terracotta roof tiles, where a compact fluorescent light is left on by the gate all night. I wonder what the view was like out that very window in 1985, when I was the age my daughter is now, and that house was just recently built. If I let my mind wander another generation back, I imagine a view of 1950’s semi-suburbanism, the vacant lots as grassy fields where neighborhood children must have played. I wish I could’ve seen the greenhouse as Frank built it, before it was partially demolished to make room for a renter’s over-sized vehicle. I can hardly envision the garage as it was before the paint peeled and the leaky roof was covered by an orange tarp whose tattered remains still cling to rotting batten boards. This is life in a dying house. The improvements we’ve made inside and out to make it livable and beautiful once again, we think of as a kind of residential hospice care, affording a bit of dignity to a well-built home in its final years. The house roof was looking really soggy in a few places, so we copied Frank and covered it with a tarp. When summer comes, the landlord will have to decide how extensively to repair the roof on a house destined for destruction. From the living room window, I see rush-hour commuters, city buses, and eighteen-wheelers barreling down a highway and I can’t help but think it must not have been like this when Frank moved in. Back then, Knight St. would have been busy with now-defunct American car brands sporting tail fins and chrome, but the mass transport of consumer goods from Asia to North America had only just begun. These days, Knight St. doubles as highway 99, a six-lane trucking route connecting the port of Vancouver to all points east. 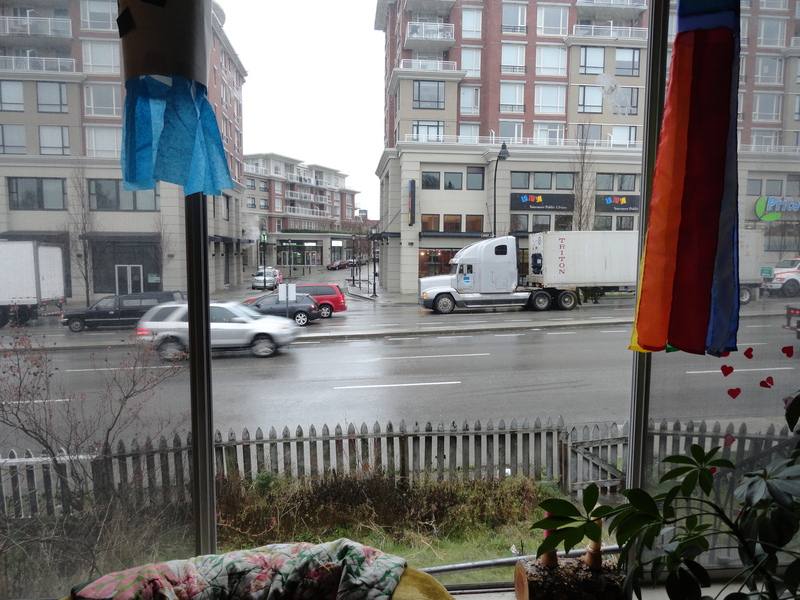 Night and day, truckloads of cheap consumer goods roll down our street, the traffic and pollution making for some really urban homesteading. The view from the living room. It's not so loud in the evenings and on weekends... and statutory holidays are pretty quiet. The irony is two-fold, however: our crumbling house and backyard mini-farm may contrast sharply with the retail and high-rise condos that surround us, but we owe a debt of gratitude to the busy Knight St. for preserving this house in its original state. If it were on a quiet residential street, this house would surely have suffered the fate of other bungalows in the area, many of which have been demolished for new construction. 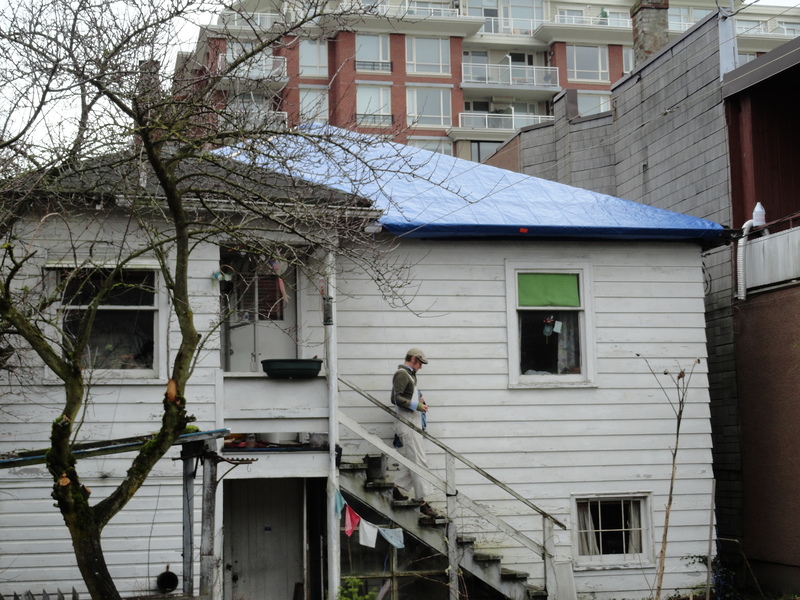 Even when they’re merely gutted and renovated, Vancouver’s EcoDensity plan would see a laneway house where a garden once grew. 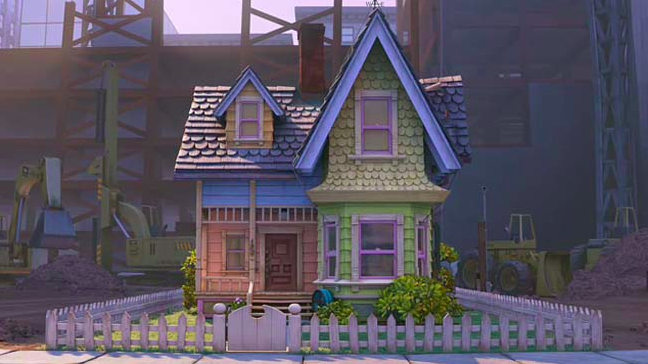 A house forgotten by time: Carl and Ellie's house in the movie Up, surrounded by high-rise construction. What we have is a true gem in Vancouver: there aren’t that many affordable single-family homes (sans basement apartment) left to rent in the city. This house is also unique in being owner-occupied for over half a century; this fact alone probably accounts for it not being torn down a long time ago to make way for commercial development. When his family moved him to a nearby senior’s center, Frank’s house–or rather, the lot–was sold to a property development corporation. Their long-term plans include razing the house and a few other properties on the block to make way for a mixed-use development of several stories. The company already owns the house next door, but their plans have so far faltered on purchasing any more of the block. So, they wait… and we wait… not knowing how long we’ll be able to live here. In the meantime, no one cares what we do with the house or the yard–we were literally told when we moved in that we could do anything as long as we leave the house standing for them to tear down–so I continue to experiment with various (impermanent) permacultural projects without fear of reprisal by a disgruntled landlord. It will be a sad day when we’re told we’ve got to go; I don’t think I’ll be able to watch with dry eyes as a bulldozer rips through my (Frank’s) garden. But, the experience and what I’m learning from working with this property will always be with me.